Although there has been a major shift of brands and retailers going digital, brick & mortar is not dead-- it is simply evolving for the digital age. Brands such as Warby Parker took their ecommerce experience and recreated it in a trendy physical space and Timberland made their brick & mortar store fit for the online shopper with “touch walls” throughout the store with more product information. Now major retailers are following suit. Learn how your brand can meet consumers’ demands and adapt for the future of digital in your brick & mortar locations by delivering a stellar product experience regardless of the channel a consumer encounters your product. Nordstrom and Bloomingdales have redeveloped the brick & mortar experience to win omnichannel by implementing new technology and practices into their physical locations. By making these investments in their physical stores, both retailers are creating an experience for their customers that is convenient and immersive in ways that connect with each type of shopper. We will dive into the different strategies each retailer took to meet this goal. 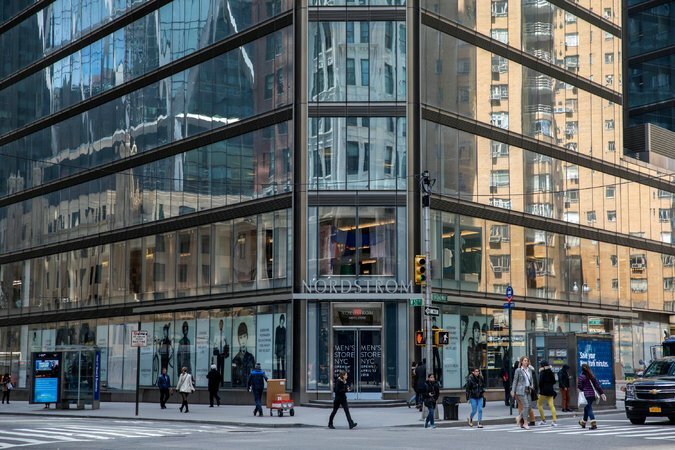 Nordstrom took a big leap by opening a new menswear store in New York City during a time where brick & mortar icons such as Toys R Us are shutting its doors. Nordstrom’s new store provides shoppers with a digital experience in the space. From screens in the suit section that show custom jackets on an avatar of the consumer, to self-returns that can be made by scanning an item yourself and dropping it in a bin, the new Nordstrom is moving towards the future of shopping. The new retail location also offers 24-hour pick up online, so if a shopper needs a last minute item, they can simply order it online and pick it up outside the store from a store associate at any hour. By providing new and engaging in-store experiences Nordstrom is paving the way for clothing retailers to focus on improving the consumer experience to a more convenient and enjoyable one. It is for good reason that Bloomingdales has been included in Gartner’s top 10 department stores in digital. The retailer completely revamped their store in Palo Alto by implementing new technology. They integrated a digital shopping experience by having smart mirrors in their fitting rooms that allows shoppers to alert an associate if they need another size and change the lighting settings so they can see their clothing in a variety of ambiences. Bloomingdales also has a mobile app that gives the shopper the ability to scan any item in the store themselves, and keep track of points if they choose to join the their loyalty program. In recent years the retailer has also been leveraging social media, using SnapChat to drive user engagement with contests that encourage customers to post their outfits in the app. This shift in brick & mortar practices means that your brand needs to be prepared. Retailers want to provide a greater experience to their customers with more engagement and convenience. Consumers want an accurate and detailed product experience right at their fingertips which means your brand needs to be ready to deliver.